I pulled our some pork leg steaks from the freezer and was about to make a quick Meat & Veg dinner when I saw the eggplant in the fridge. 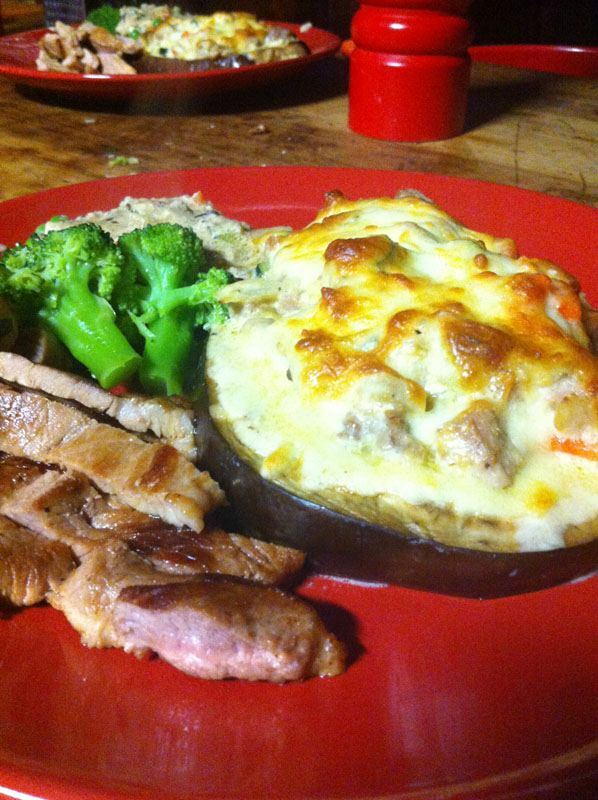 This is a really simply dish to make up and its scrumptious! 2. 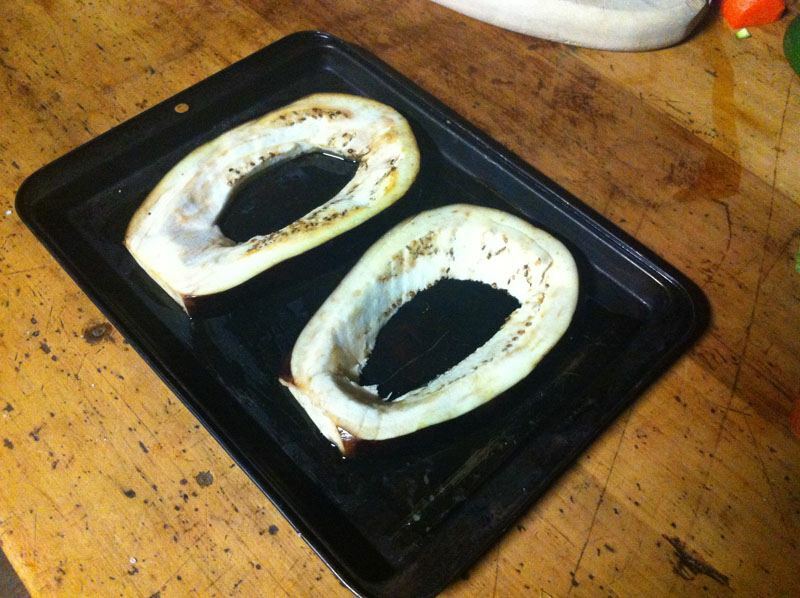 Take the Eggplant slices and cut out the centre. 3. 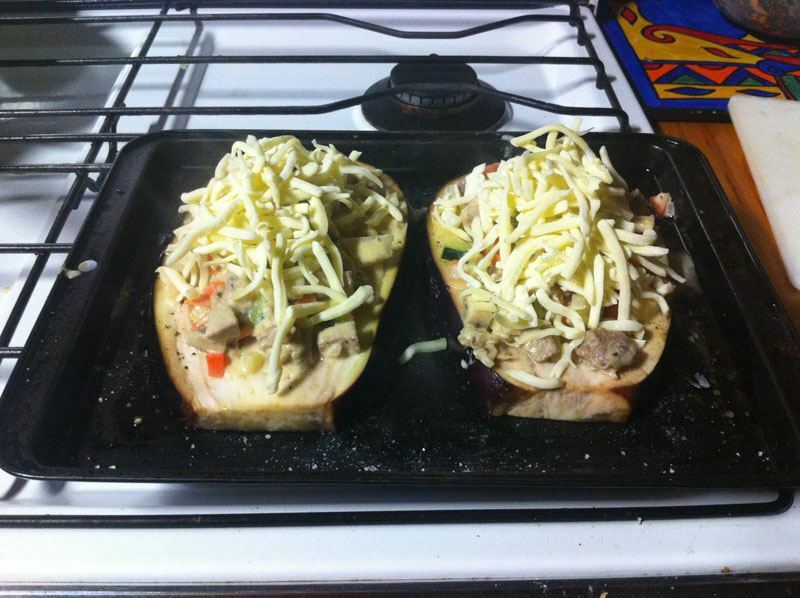 Place the outer shell of the eggplant on a baking dish. 5. Fry the pork steak pieces first in a frypan with butter until brown then add the rest of the veggies. 7. Spoon the mixture into the eggplant outer shells. 9. Bake in oven until cheese is brown. (20-30 minutes. 10. While baking, cook peas and brocolli as you prefer (I like to steam mine) and time it right with the dish in the oven. 11. Fry up the remaining pork steak and cut into slices. I am not sure if you buy Pork Leg Steaks from a butcher or supermarket as these are from our own pig from the farm. But any cut of pork will do, so long as you can dice it. I used Milk and parmesan cheese in this recipe because at the time, we had run out of thickened cream. I kept this recipe here exactly as I made it, but I think next time I would substitute the parmesan cheese and milk for thickened cream.